Tonight I pushed through the imperfections and assembled the backstool. I need to pin the crest rail, cut the legs, and sand but it’s pretty much a chair at this point. I look forward to sitting it it tomorrow. Between travel and honey do lists (plus an ongoing eat with raccoons) progress has been slow but I’m finally done traveling so hopfully I can knock this out the rest of the way. Good news, this is my last week traveling to Dallas. Unfortunately, next week I’m heading to Amarillo (which is only a problem because it is hard to get to). 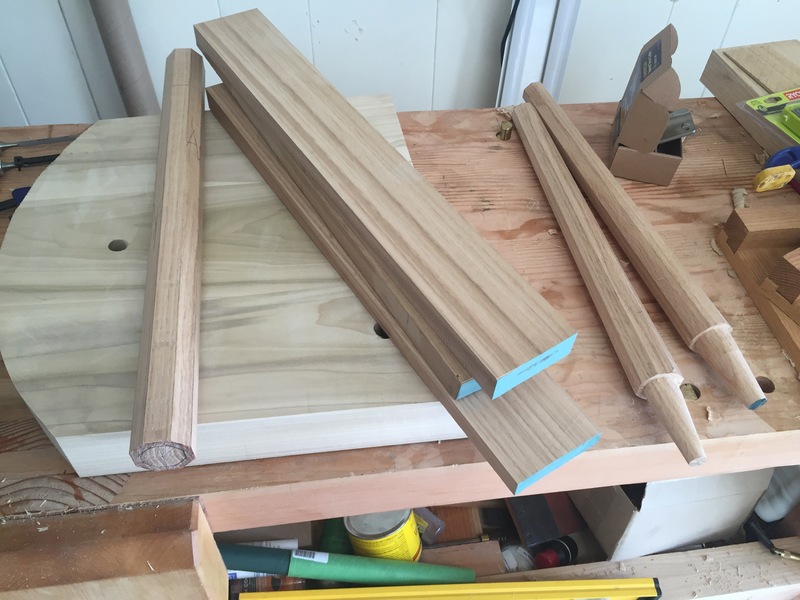 After unclamping the crest rail from last weekend I decided the split was salvagable, particularly for a prototype. I slathered on a bunch of PVA glue, worked it into the split, and clamped it together with parchment paper over the joint and let it dry overnight. After unwrapping It was time to square up the crest rail. 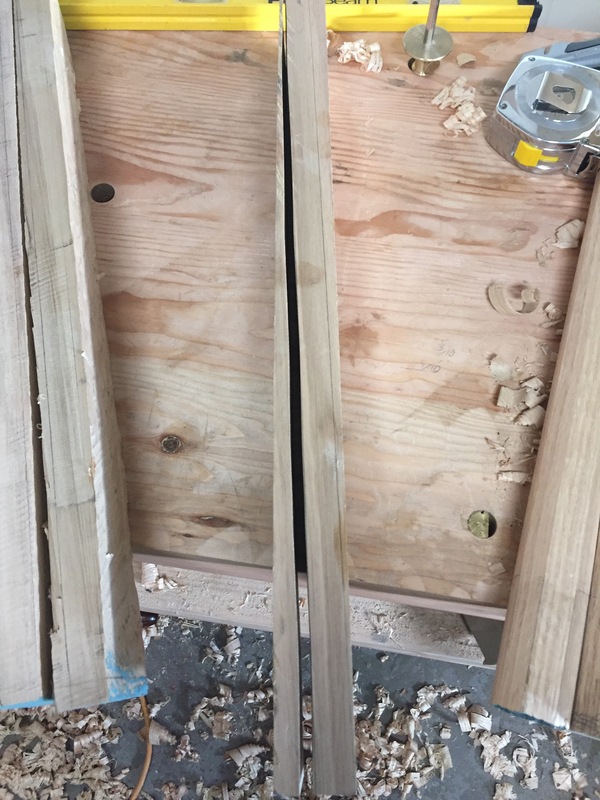 The inconsistent clamping pressure resulted in a weirdly dimensioned final piece: one edge of the rail was 3/4 inch thick and the other was 7/8 inch thick (split was on the thicker side). 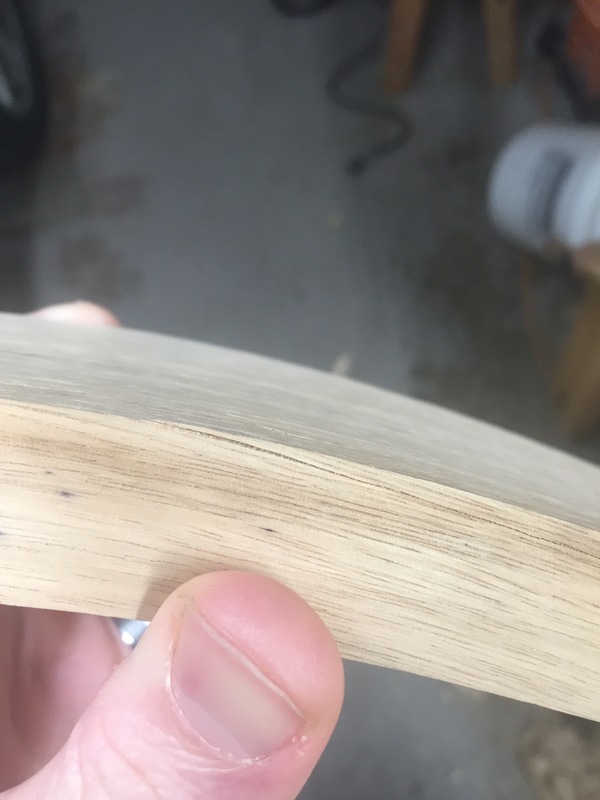 Based on this fact, I planed both edges to be square to the inside face of the curve (since that’s the side where the angle matters) and decided the split/thick edge would be towards the bottom. 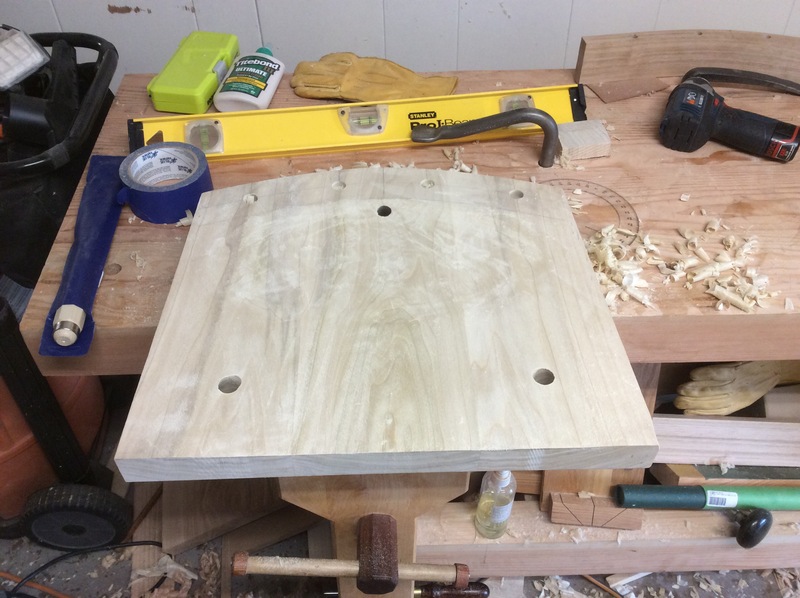 And drilled the mortice holes using a cheap benchtop drill press from Craig’s List. 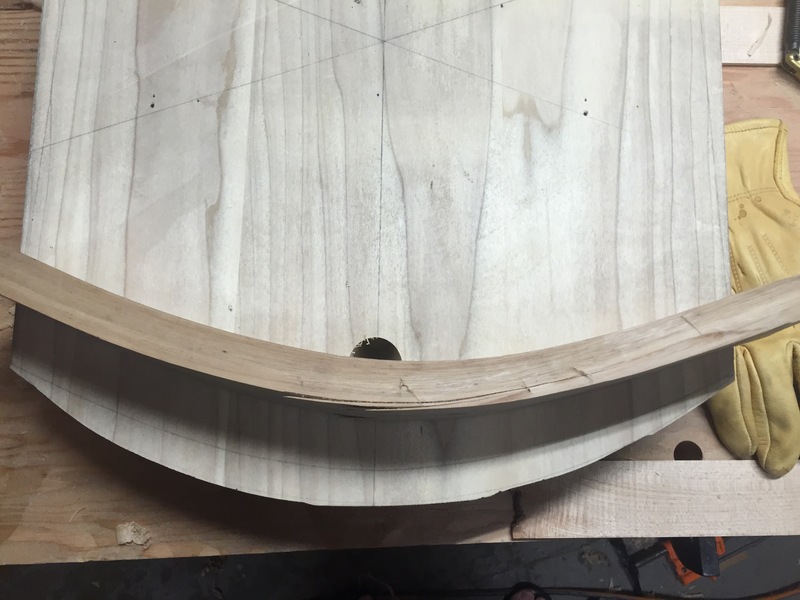 The seat received some shaping as well. The back edge curve needed reworking since it was originally cut based on the form. The reduced material made me decide to not bevel the back edge but the other three sides received the 1 and 1/8th chamfer. Next the same crappy drill press drilled the holes for the spindles and it was time to saddle. 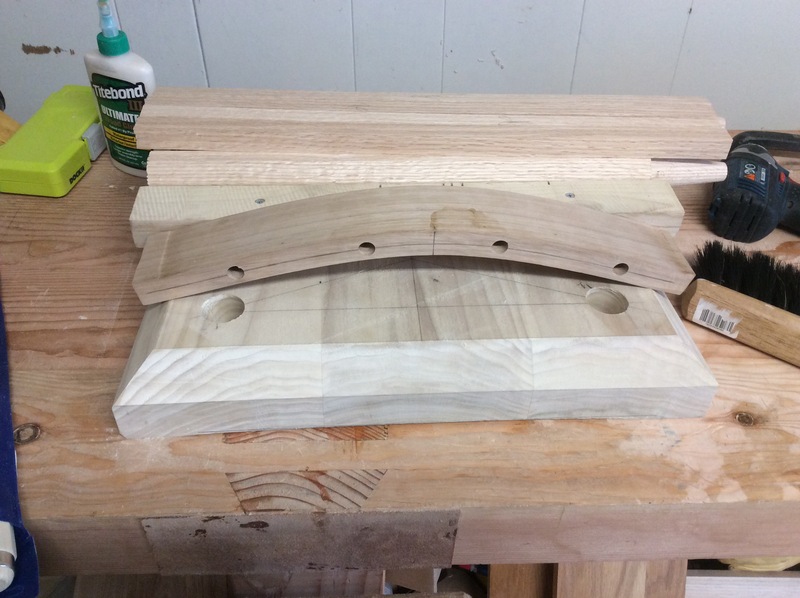 My original plan was to plane a gentle curve from side to side that ran the length of the seat (the back edge would dip the same as the front). 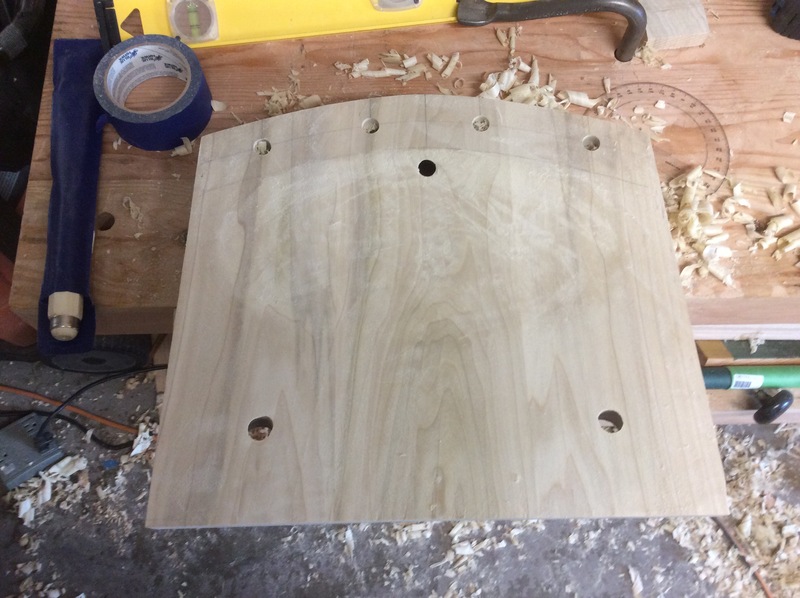 For some reason I decided to move away from this plan and scooped out a 5/16th deep bowl using a gouge and pullshave and then planed an 3/16th deep cube that connected to the front edge. Still needs some refining but it is starting to take shape. This amount of craving is not repeatable in the dining chairs as Tazmanian Bluegum is hard stuff but it is fun to mess around with. 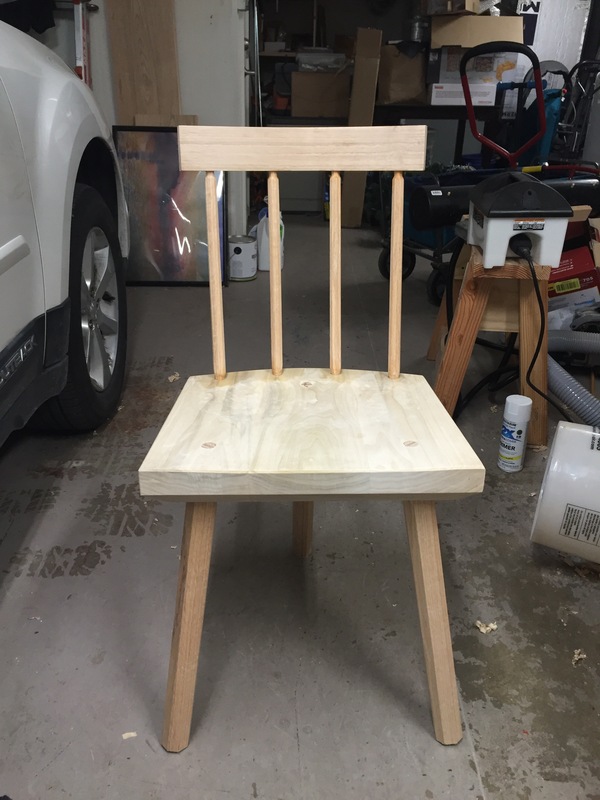 It would be interesting to try with softwood for a Windsor chair. Getting close, hopfully I can assemble the undercarriage this comming weekend. I have been home the past two weeks but I have had family staying in our tiny house and I have been a bit burnt out so very little progress has been made. 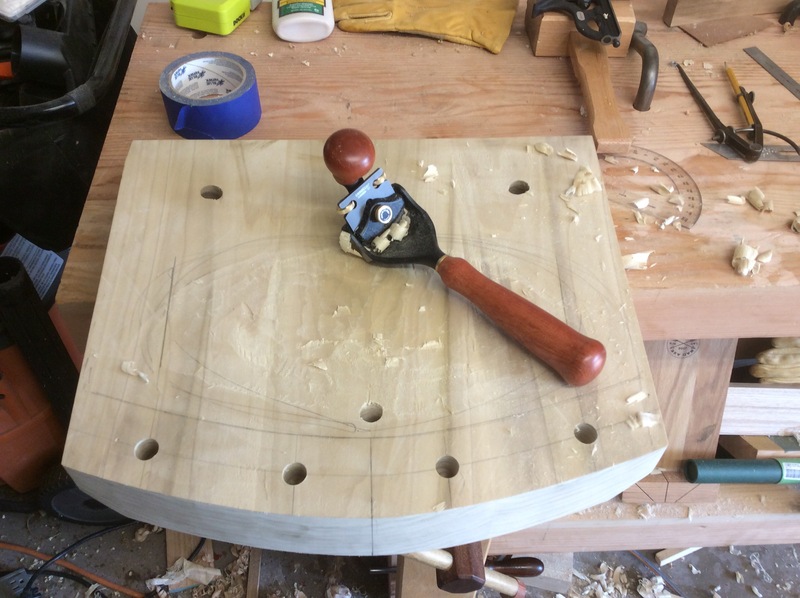 I did start (but not finish) building a new steam box and I used the band-saw to mill straighter grained boards for my crest rails. 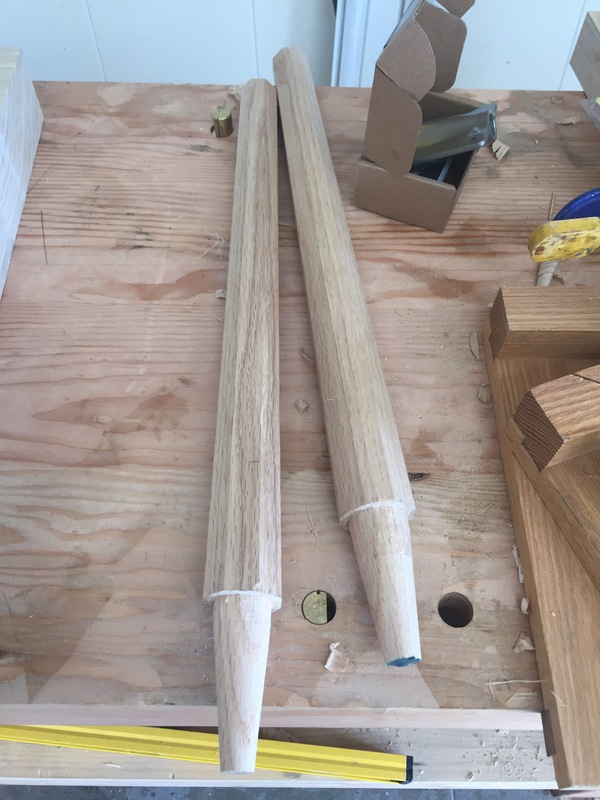 I also managed to octaganize the legs and taper two of them before I realized it would be easier to saw the tenon cheek before they were tapered. 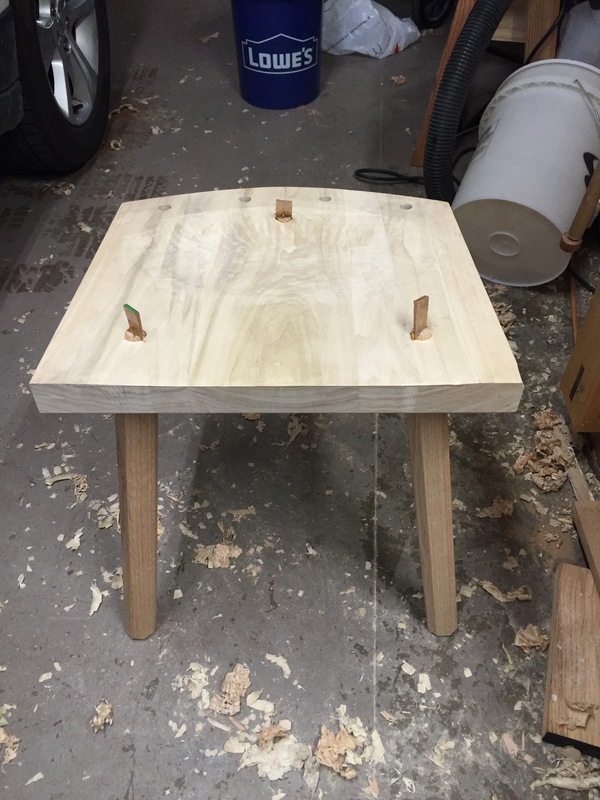 I then sawed the cheeks for all three and shaped two of the tenon a before I realized the back stool legs are not tapered. Luckily I have two extra blanks ready to go so these will be set aside for a chair. All in all, it’s good to see progress. Hopefully I can successfully bend a crest rail next weekend and get the undercarriage assembled.